31 Days Of Horror Over 31 Years Of Scary Movies! 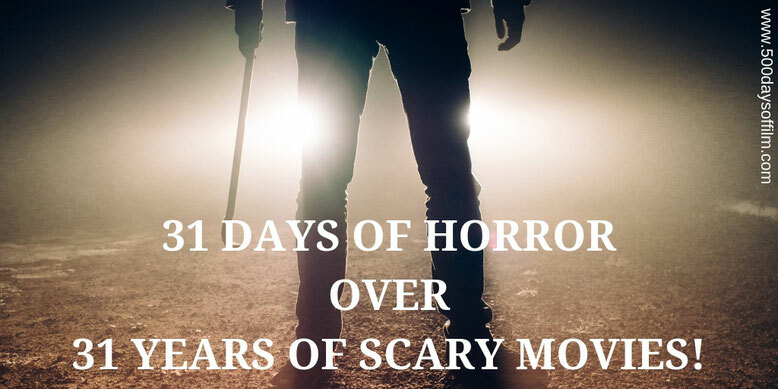 Every October, horror fans across the globe challenge themselves to watch 31 scary movies - one for every day of the month (but you’d probably already guessed that / done the maths). The challenge lies both in the ability to withstand weeks of disturbing horror and terrifying scares and also in creating that list of 31 films. It is very tempting to stick with your favourites - horror classics such as The Shining, The Thing, Halloween, Friday The 13th and Nightmare On Elm Street. While this guarantees a great month of movies (many of these films feel like old friends), it is not exactly what I would call a challenge. As a result, this year I have decided to take a different approach. I have chosen my favourite horror movie for every year over the past 31 years (UK release dates). The compilation of this list has proved something of a challenge in itself (1991… what happened?) but it has resulted in a rather intriguing list of scary movies. In a controversial opening move, I have chosen A Quiet Place over Hereditary - a film that I prefer and that unnerved me for days. However, there is a practical reason for this decision. Hereditary isn’t released on DVD until 8th October. Not helpful if you are starting this challenge on 1st October (unless, that is, you work this backwards... in which case I would go for Hereditary). A Quiet Place deserves its spot at the top of this list simply for reminding us of the joy (and necessity) of a silent cinema audience. John Krasinski’s film - about a family who have to stay quiet in order to survive - is smart, tense and features superb performances from its impressive cast (Emily Blunt is brilliant… of course). No surprises here, Get Out was my favourite film of 2017. Jordan Peele’s movie is both wonderfully entertaining and extremely disturbing while also exploring important issues concerning race and discrimination. A new horror classic, Get Out is an intelligent and layered film - a thrilling movie that makes you think and provokes much debate. Under The Shadow is a rare beast. Writer/director, Babak Anvari, has created a chilling, intelligent film with a powerful feminist message. This movie is an absolute gem. Seek it out in whatever way you can. Damaged by a rather misguided marketing campaign, The Witch is a superb horror film from director, Robert Eggers. Favouring a slow burn strategy, Eggers’s film ramps up the tension and suspense until you can bear it no longer - leaving you with a lasting sense of unease (and a new fear of goats). The Babadook delivers all you could want from a horror movie. It is a scary and unsettling story with characters about whom you actually care. Crucially, you never feel safe whilst watching this film - director, Jennifer Kent, keeps her audience on the back foot. Is The Babadook real or just the embodiment of Amelia’s grief and sleep deprivation? Is Samuel evil or simply a troubled and vulnerable little boy? Mike Flanagan’s film, Oculus, is a chilling story about a creepy (and possibly possessed) mirror. Mirrors are, of course, much used in horror movies. However, this one stands apart thanks to a superb central performance from Karen Gillan, an interesting non-linear narrative and a pretty unsettling ending. The Cabin In The Woods may not be particularly scary but it is a lot of fun. This film, from director Drew Goddard, feels like a movie made by horror fans for horror fans. It doesn't entirely land its conclusion, but it is a thrilling ride. Much like Hereditary, Kill List left me reeling... for days. I just wasn’t prepared for this darker than dark, genre bending story. Ben Wheatley takes his audience on a twisted journey into almost unbearable violence, tension and horror. Pure genius. By 2010, we were all (to put it mildly) growing tired of found footage movies. Then along came Norwegian mock-documentary, Troll Hunter. The sheer brilliance of André Øvredal’s film lies in how he makes an outwardly ridiculous concept (the idea of troll hunting) seem real and full of danger. The film's tension is also impressive - particularly in the moments before we meet our first troll. Oh I just love Sami Rami’s Drag Me To Hell. This movie is so much rollercoaster fun with a superb central performance from Alison Lohman, tension, horror and many, many effective jump scares. Oh and a killer ending to boot! Perfection. JA Bayona’s The Orphanage is one of my all time favourite horror movies. The key to this film’s effectiveness (and lasting success) is its perfect blend of scares and powerful emotion. It would take a cold, hard heart not to be moved by Laura’s plight. Meanwhile, it would take a braver constitution than mine to resist the film’s unsettling atmosphere. Bayona employs classic horror tropes - the haunted house, the fear of creepy children and the “hysterical” woman - to create a compelling and utterly gripping mystery. However, he also brings something new and unexpected to the tale - and one of the most stunning film endings of all time. When The Orphanage’s secrets are revealed and the story’s loose ends finally come together, we are left shocked and devastated. The horror genre is full of movies about paranormal skeptics whose conviction is then severely tested. Mikael Håfström’s adaptation of Stephen King’s story takes you (along with John Cusack’s ghost debunker) on a slow descent into terror. Don’t get me wrong, it’s no The Shining (what is?) but 1408 is a gripping and chilling story full of lingering dread. Guillermo del Toro’s masterpiece, Pan’s Labyrinth, is a visually stunning, dark and brutal fairytale that explores both supernatural/fantasy horror and also the evil that comes from unfettered power. The stuff of the most beautiful of nightmares. The Descent is another of my all time favourite horror movies (actually my favourite after Jaws). To me, Neil Marshall’s film is perfect. The key to this film’s enduring success is how quickly we become invested in the characters that go on that ill-fated spelunking expedition. From that point on, The Descent’s horror can be broken down into three parts. One, being stuck underground, two, the things things that are down there with you and, three, the absolute horror of losing those you love. All of these elements combine superbly in this film. The story is also told with brilliant reference to other horror movies (Carrie, Deliverance, Apocalypse Now). These excellent storytelling techniques enable Marshall to build the film’s almost unbearable tension - just remind yourself to breathe! It is easy to remember Shaun Of The Dead’s classic moments of comedy. However, every time I watch Edgar Wright’s movie (which I do often), I forget that this is also an extremely effective zombie horror film - and a pretty moving one at that. You can find fault with many Final Destination movies, but you certainly couldn’t criticise the franchise’s innovative (and morbid) imagination. While I love the first film, Final Destination 2 also holds a special place in my heart - the opening ‘road’ sequence alone is masterpiece of horror cinema. Dark Water is a brilliant exploration of two key (and interconnected) fears - a child’s fear of being abandoned and a parent’s fear of losing their child. Hideo Nakata’s film is simple but terrifyingly effective. Wonderful. One of my favourite ghost stories, Alejandro Amenábar’s The Others is a chilling and twisted tale that features a superb performance from Nicole Kidman. The film became an instant classic - one that bears many repeat viewings… if, that is, you are brave enough. Ginger Snaps is a smart and endlessly entertaining film - and one that doesn’t mind getting its claws dirty. I love the central sisters in John Fawcett’s movie. Ginger and Brigette are brilliantly strange - and that's before any full moon-related antics kick in. A cultural phenomenon, The Blair Witch Project is a true horror classic. One of the best examples of movie viral marketing, Eduardo Sánchez and Kevin Foxe’s film remains a compelling and terrifying watch all these years on. Wes Craven’s Scream became a world-wide sensation when it was released - reinvigorating the horror genre, becoming a hugely lucrative film franchise (and television series) and inspiring a host of new scary movies. I revisit Scream at least once a year. It never fails to impress - making me laugh and getting my pulse racing. Craven’s classic has aged remarkably well (apart perhaps from Sheriff Burke’s interrogation of Billy Loomis: “Let me ask you this, what are you doing with a cellular telephone son?”). Of course, one of Scream’s greatest decisions was to cast A-List actor, Drew Barrymore, in the role of Casey Becker and then subjecting her to 13 brutal minutes of horror. In addition, Craven’s film is, of course, wonderfully self aware - featuring more scary movie references than you could shake a knife at. Perhaps not strictly speaking a horror, David Fincher’s film certainly features many disturbing and horrific images - as you might expect given its focus on a serial killer who is inspired by the seven deadly sins. The seventh film in the Nightmare On Elm Street franchise, New Nightmare saw the return of Wes Craven as director. The film explores the wider impact of horror movies by following the terrifying experiences of the ‘real’ cast and crew. Another visually stunning classic from director, Guillermo del Toro, Cronos explores immortality and the terrible price that must be paid by those who seek it. Urban legends prove fertile ground for horror movies and nowhere is this more horrifyingly evident than in Candyman. Bernard Rose’s film is smart, gory and very, very scary. Oh and, no, I still can’t stand in front of a mirror and say Candyman five times - can you?. Okay, yes, Martin Scorsese’s Cape Fear is more of a thriller than a horror movie. However, it does contain many horror elements and features Robert De Niro’s evil and terrifying Max Cady. 1991 was a terrible year for scary movies… so forgive me this little cheat. What more can be said about Jonathan Demme’s superb, Oscar winning film, The Silence Of The Lambs, except, yes, of course it is a horror movie - and a brilliant one at that. Another Stephen King Adaptation, Pet Sematary has many flaws but deserves its place on this list because of one terrifying and disturbing (hint... Zelda) scene. A scene that has nothing to do with pets at all. I don’t hold much affection for the Child’s Play franchise but will admit the value in the original - both because it is a lot of ridiculous fun and also because it introduced us to the iconic character of Charles Lee Ray - aka Chucky. In addition, Bill Butler’s film allows us all to acknowledge that dolls are inherently creepy and should be monitored at all times. What do you think of this list of 31 horror movies over 31 years? What would you add or change? Will you be attempting the 31 days of horror challenge this year? Let me know in the comments section below or over on Twitter. You can find me @500DaysOfFilm.